First I had cheesecake for breakfast, then I shoveled off the calories, moving mountains of mercifully fluffy snow with help from my boys, their friends and my faithful German shepherd, Buddy-Boy who supervised the job. Next, I set out to make Manti dumplings from the country of Kyrgyzstan for lunch - a perfect way to spend a blustery, blizzardy day! Santa brought me a bunch of really cool kitchen stuff this year, including a bamboo steamer I used to make these dumplings. In Kyrgyzstan multi-tiered steamers are called mantishnitza, and are made out of steal, not bamboo, but this was perfect to get the job done. My Mom also gave an incredible Japanese 6" Santuko knife with a double bevel that I immediately cut myself on. I don't have good knife handling skills, but this mini samurai sword might just motivate me to hone them in a hurry. Located in Central Asia, Kyrgyzstan is a mountainous landlocked country that borders Kazakhstan, Uzbekistan, Tajikistan and the People's Republic of China. 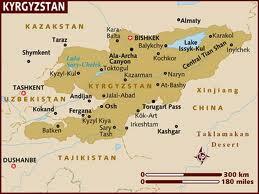 Food in this country is very similar to that eaten in Kazakstan and relies mainly on horse, mutton and milk products. Stews, skewered meat, dumplings and noodles are all staples. The fat- to-meat ratio tends to be high, producing delicious dishes that are best eaten hot. Manti are considered a typical, local dish, but there is some dispute as to where the dumplings originated, some claiming they are Turkish or Tartar. Regardless, there seems to be consensus that their origin is somewhere in Central Asia. Hands down, my family voted these dumplings their favorite of all the "stan" countries I've cooked in thus far. to make the dough. If you don't have one, it's fine to mix by hand. 1. Combine the flour and salt in a mixing bowl. Add the eggs and water, mixing well with your hands. Add more water if needed, to form a soft dough. Cover and set aside for at least 30 minutes. 2. Shred the onions and place them in a colander or sieve and set over a bowl to drain the juice and discard. Combine the onion, garlic, ground beef, potato, red pepper flakes, salt, pepper and cumin; mix the meat well with a spoon until well mixed. 3. Divide the dough into 4 equal pieces (keep covered in plastic wrap to avoid drying out). On a floured surface roll dough out into a rectangle shape, rolling dough as thin as possible without tearing it. Cut the rectangle into 2-3 inch squares with a knife. 4. Place about 2 teaspoons of the meat filling in the center of each square. Bring up two diagonal corners of the dough and press them together on top - do the same with the other two corners. Repeat until all are filled and sealed. 4. Place the prepared manti onto steaming trays or steamer basket so they don't touch each other to avoid sticking. Steam for 20-25 minutes. Final Assessment: These dumplings were delicious and easy to make. Like anything that involves making dough, it takes a little bit of time and makes a little bit of a floury mess on your counter top, but so what, it's all worth it when you bite into a tender and satisfying dumpling fresh from the steamer. A++ from the dudes in my family.